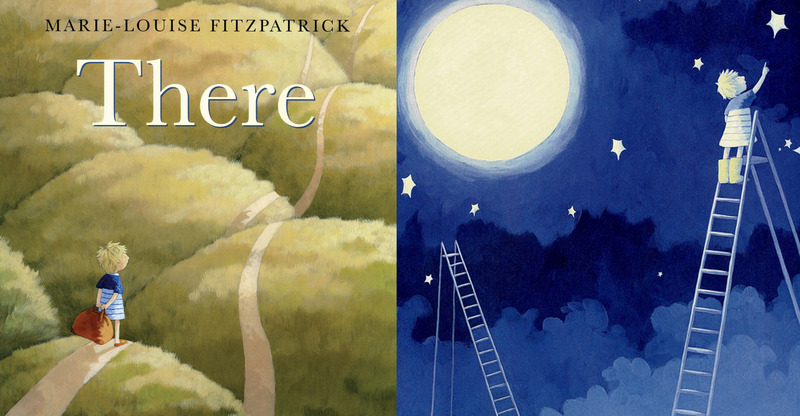 There by Irish author-illustrator Marie-Louise Fitzpatrick is a marvellous picture book. It is the story of a young girl who asks the dreaded question ‘When will I get There?’ The strength of this book lies in it’s illustration and play on words. It is one of my favourite picture books due to the duality of the book- it is aimed at children but the message of the book is firmly aimed at adults. 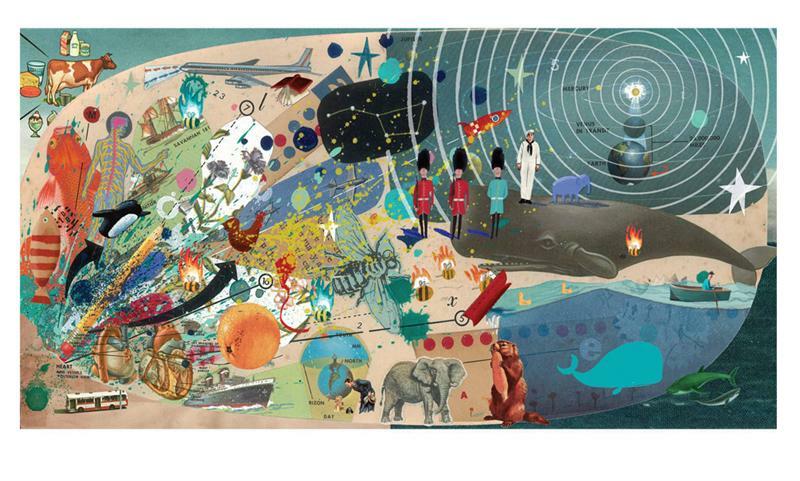 Fitzpatrick’s illustrations are stunning, soft, somber colours mix with vibrant reds and blues. The illustrations are simple and subtle but in my opinion there is a very ‘Irish’ feel to this book. There is beautiful drawings of huge rolling green hills and soft rainy days and the girl goes through various scenes which look right out of Ireland, like this one shown below. Can I stop along the way? 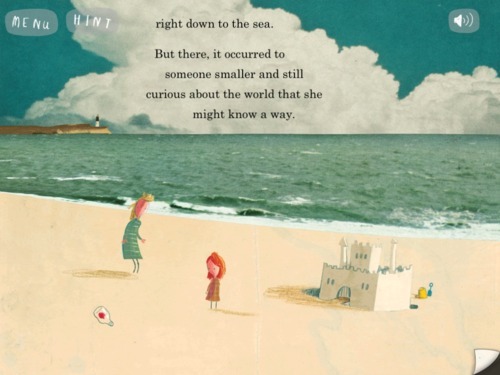 The child reader will love the simplistic nature of the questions and the illustrations accompanying them but the adult will also stop to think about this magical place called ‘There’. Most adults, myself included are constantly worried about goals and ambitions, we are so caught up in our career paths and personal ambitions that we often forget about life’s joys. Children enjoy the simple things in life and the author reaffirms this cleverly in the concluding page. It reads ‘I’ll go There tomorrow.’ and it is accompanied by a beautiful picture of the girl flying a kite. 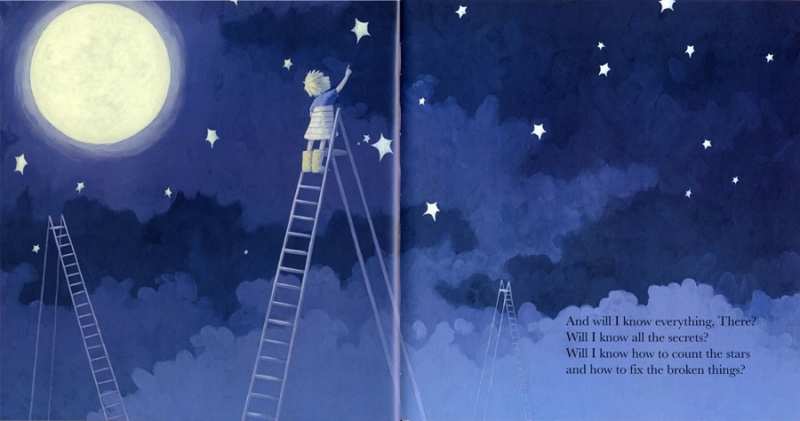 I cannot speak highly enough of this book, it would be a wonderful book to read to your child at night, it could be read again and again with different things spotted on each page. Children love repetition, and they could easily read this book with their mothers or fathers before going asleep at night. A brilliant book with a real celtic feel! In my opinion this book deals with the topic of depression and sadness in children. 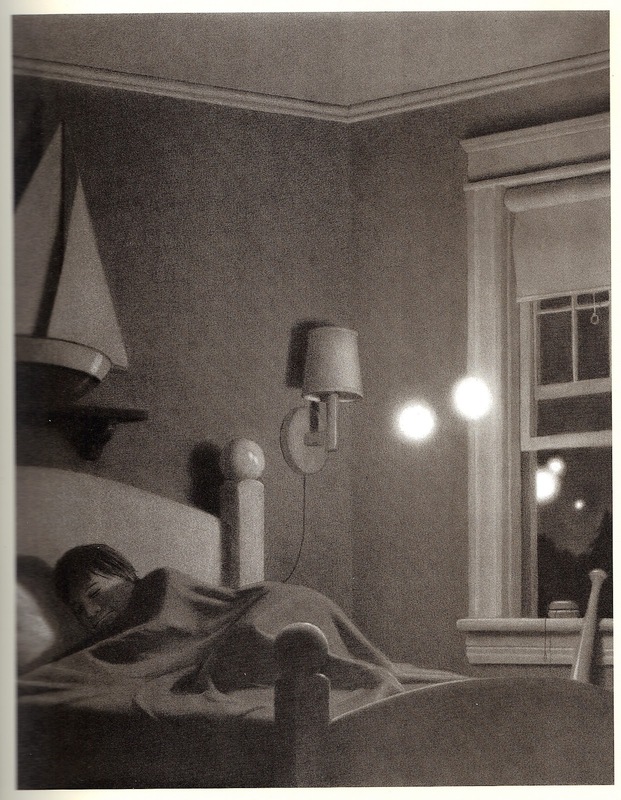 It begins with a picture of a girl waking up in a bleak room. Each image from then on is describing the emotions one feels when they are overwhelmed and lost with sadness. Tan does this expertly through the use of symbols and colours. Some of his descriptions for emotions are striking, as seen below. Two words accompany this image: ‘Nobody understands’ I think this haunting illustration perfectly sums up how one can feel so isolated and closed off from the world in times of stress. 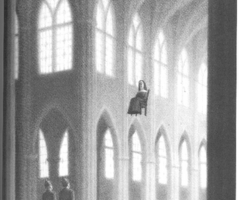 Scale and perspective are used to excellent effect in the book. The girl is always dwarfed by monstrous shapes and beings to underline her powerlessness in spite of her feelings. The image below shows the sudden weight that depression could bring on a person ‘Darkness overcomes you.’ is the line describing the image. I have looked many times at this book and I always find something new, there are literally hundreds of shapes and hidden signs interlocked in the background and in other objects. The artwork in the story is a thing to behold. One of the most vibrant and vivid pictures I have ever looked at appears below to describe how wonderful things pass us by when we’re overcome with grief or sadness. I admire this book on so many levels. The text and the images combine to produce a powerful message. The book is bleak but has a hopeful ending which I felt was important to include. 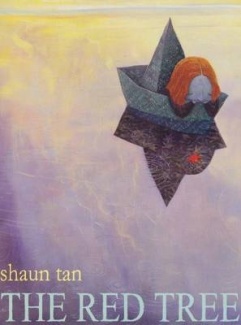 I admire Tan’s ability to produce a book which deals with the feelings of melancholy which develop in children. Tan himself refutes this, saying he completes his books without thinking of an audience but I think this book is a work of real merit. 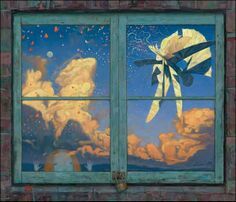 He is one of the top illustrators in the genre and I often wonder is it an injustice to call his books picture books as they are very hard to define. This is a book most people should try and read once. I think people will identify with it’s strange but hopeful message. I know everyone who reads this book will empathize and understand what the protagonist is going through. This book is a marvelous achievement as I believe it breaks out of the genre of children’s literature in a way, it tackles the taboo topic of depression and grief in children. This is my interpretation, I would like to hear your view. Do you think The Red Tree is one of the greats? 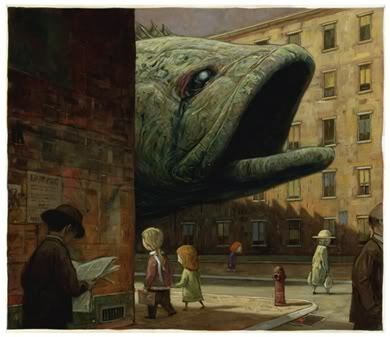 Would you agree that Shaun Tan’s talents don’t get the recognition they deserve? Please comment, I’d love a different opinion! 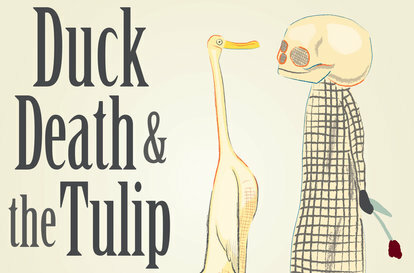 Duck, Death and the Tulip-A Picture Book for Adults? 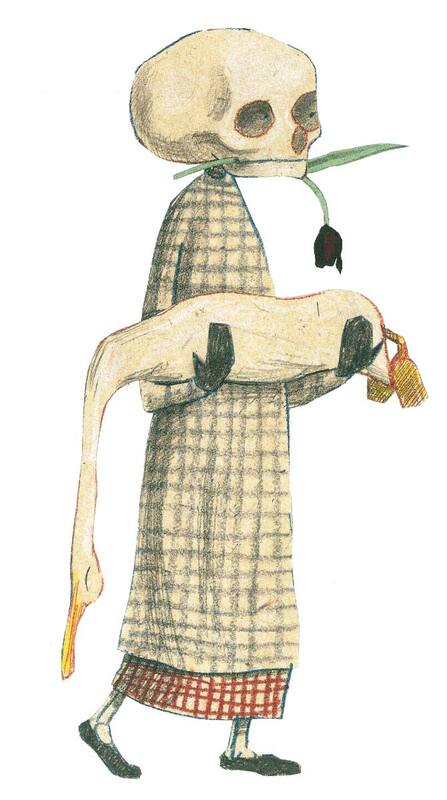 Duck, Death and the Tulip by Wolf Erlbruch is a delightful and unique picture book. 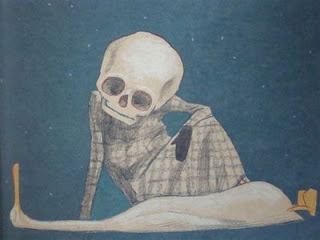 It is humorous and takes a philosophical look at mortality. Is it a picture book for children? I’m unsure whether children would get a grasp of this morbid theme but as an adult, I think this is a fascinating book which will make you query what happens after life ends. The story questions why people obsess about death so much during life. For a while now, Duck had a feeling. ‘Who are you? What are you up to, creeping along behind me? Duck was scared stiff and who could blame her? This is the blurb that accompanies the book. 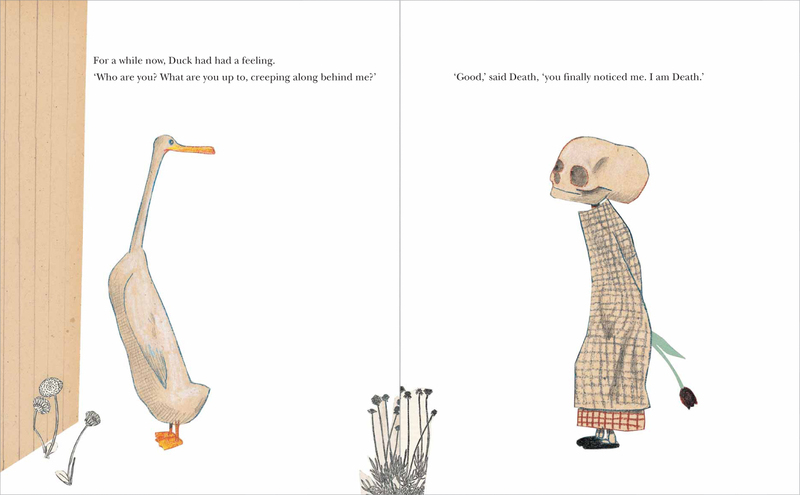 The story ensues as Death and Duck strike up a friendship, it turns out Death has been following Duck all her life and as they become friends, Duck has many questions on mortality and what the afterlife is life. Duck asks many questions on heaven and hell, but Death is coy in his replies, remarking how much ducks think about Death. The story is amusing, the illustrations by Erlbruch are distinctive, he uses a lot of negative space in this book to good effect as seen below, most pages just have the two characters and a prop, this adds to the philosophical theme of the book. I liked the way Death dealt with questions, at one point Duck asks whether Death is going to make something happens so she’ll die soon. Death replies that he won’t do that because ‘Life takes care of that: the coughs and colds and all the other things that happens to you ducks. Fox, for example.’ I was moved by this reply, we as the human species seem obsessed with the afterlife and death in particular as if it is a giant monster towering over us once we reach a certain ages. 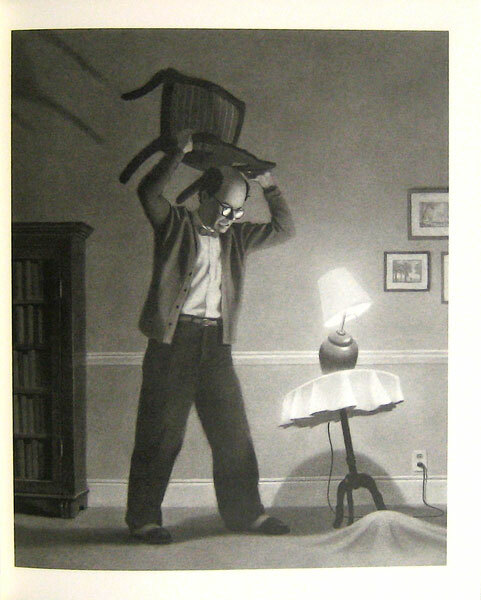 The character in the books dismisses this notion, that the things that kill us are in everyday life. ‘For a long time he watched her. When she was lost to sight he was almost a little moved. These lines are so filled with irony and are an obvious paradox, I couldn’t help but marvel at the authors skill in his concluding line to show that Death viewed ‘life’ as the killer of all. This book is a beautiful piece of art which would appeal to anyone who likes a book with a devilish sense of irony and humour. 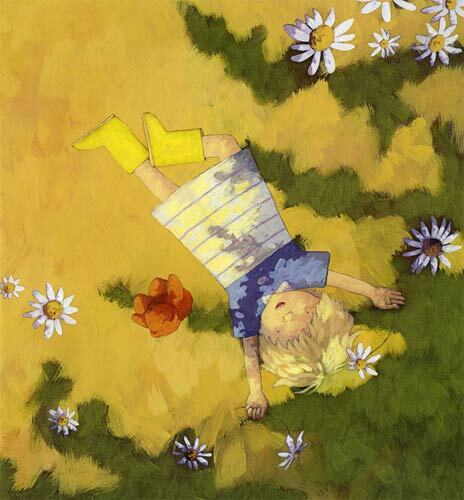 It poses poignant questions on mortality, one should not snub this book as a children’s book. Everyone who reads it will pause for a few moments to contemplate Erlbruch’s message. But what is that message? It’s up to the reader. 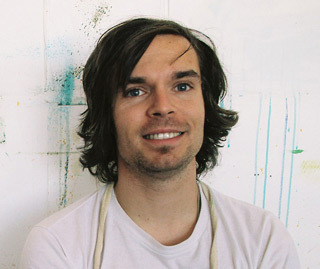 Oliver Jeffers is a writer and illustrator of exceptional talent. He is one of my favourite illustrators and when I first came across his works it delighted me to know he comes from these very shores of Ireland. His illustration style is quirky and colourful. His stories are also entertaining. 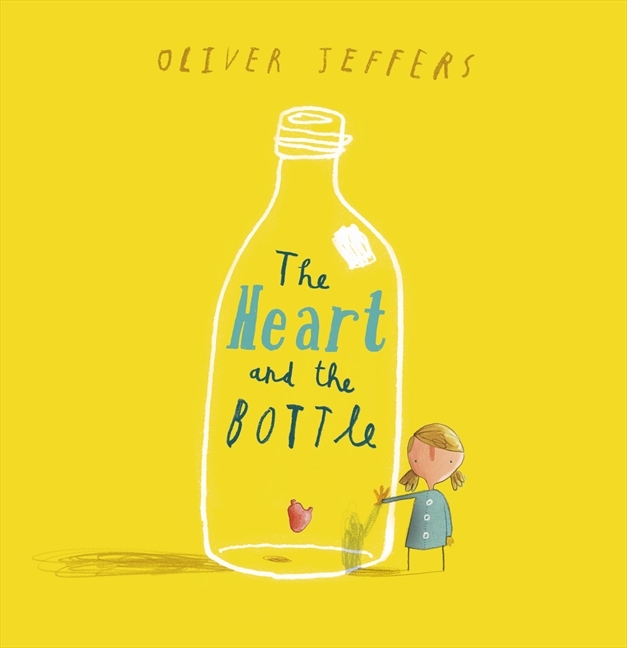 The Heart Shaped Bottle is a book I hold dear but it is not my favourite Jeffers story, that place is held for Stuck or This Moose Belongs To Me , I can never chose which book I prefer more. The Heart Shaped Bottle is an endearing story of a young girl who is full of the wonders of the world. 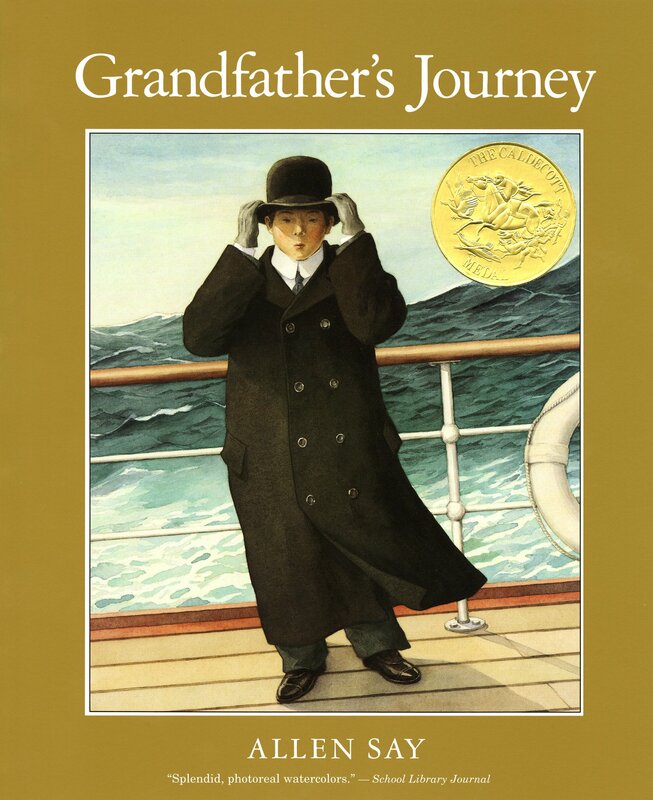 Her grandfather is her facilitator in this regard, answering the curiosities that fill a young child. One day her dear grandfather is no longer around( she finds an empty chair one day where her grandfather used to sit, as seen below) The young girl is so distraught that she ‘takes’ out her heart and puts it in a bottle to be safe for the rest of her life so no one can hurt her again. 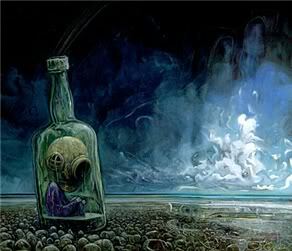 An amusing story ensues where the protagonist tries to figure out how to unlock her heart once again from the bottle. I liked this book because of the colours and the patterns. Jeffers mixes photographs with illustration to give the story a surreal look. An example of this is in the below picture. As with all his books, the story takes on the bizarre as the main character goes through all sorts of ways to break the bottle surrounding her heart. There is a great sense of wackiness in the book and this is perfectly demonstrated in the below picture. It is a picture I look at frequently as it is packed with random objects and animals, you spot new items each time you look at it. The tale itself is a very poignant one and could be a useful book for a parent trying to explain the loss of a loved one to a child. In my opinion, this story is one of grief and what we must do to overcome the sense of loss in our lives. 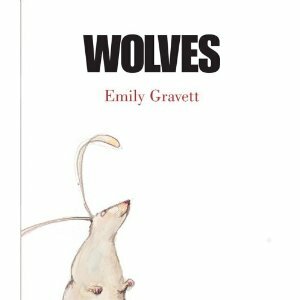 Emily Gravett has been producing high quality picture books for the last few years. 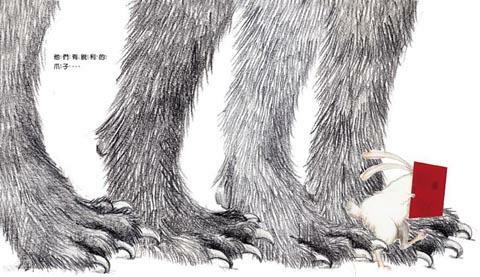 She is an award winning illustrator and author, her greatest work in my opinion is Wolves. 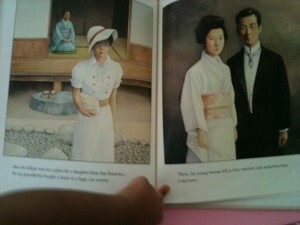 It won the Kate Greenaway Medal for illustration. The vast majority of readers dismiss all picture books as simple books designed to keep infants occupied for a few minutes. That is not the case .There is a lot of bad picture books on the market but if you take the time to read a good one by Maurice Sendak or Anthony Browne for example and appreciate them, it can be a wonderfully rewarding experience. 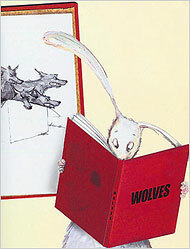 Wolves is the story of a rabbit who goes to the library and borrows a book on wolves. As he reads the story on his way home, he becomes part of the story he is reading and is unknowingly stalked on by wolves. 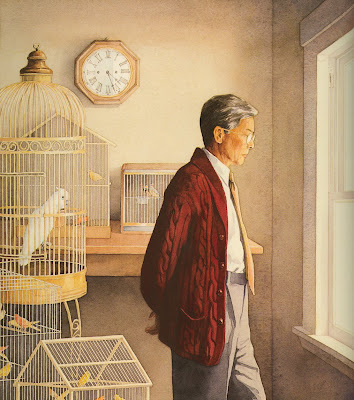 I love this book as it is an example of a postmodern picture books that has more than one meaning and the author acknowledges that the reader is actually reading the book an addresses them, giving an alternative ending even if they wish. There is also little pockets in the pages like a library stamp card that a child would love to play with. Gravett loves to play with the book itself as an object, she has done this with other titles such as Little Mouses Big Book of Fears and Again. It makes her books in particular stand out against the crowd.An example of this can be seen in the below picture. 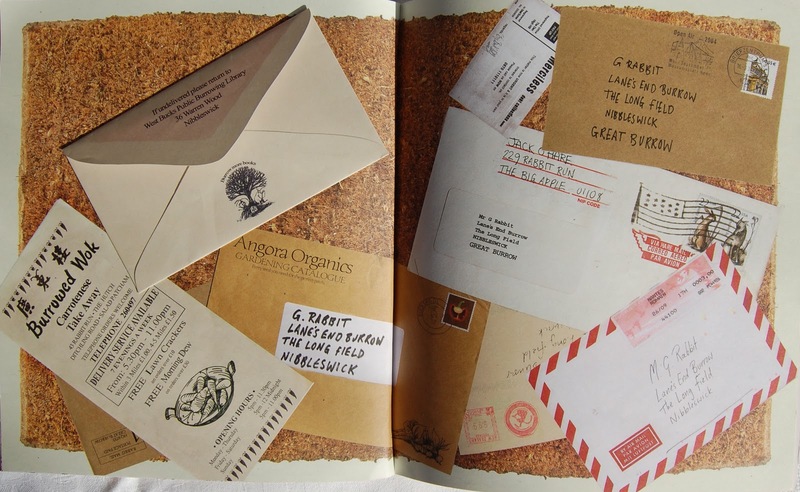 Gravett uses different kinds of paper textures and shades when compiling some of her latest books and this is evident here. 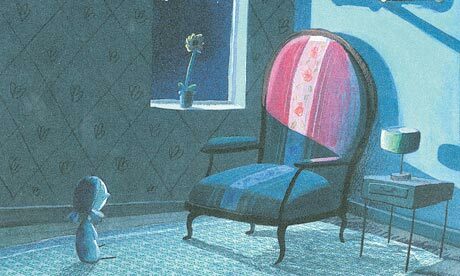 The story itself is brilliant as we are unsure whether the rabbit is reading the story or is he becoming part of the story and is in grave danger. 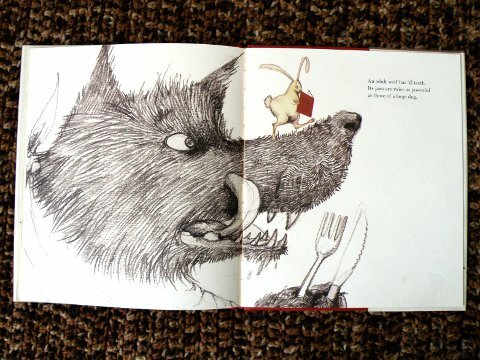 Adults will enjoy the narrative disruption and discontinuity in the text as it plods along, children loves to play with the actual book itself and to find out whether the rabbit is going to meet an untimely demise( There is two endings if you don’t like to see bunny rabbits coming to a gruesome end.) Her ability to make her books quirky with hidden slips, holes, and pop up pictures draw a lot of reluctant readers to pick up her books in the library from my experience with children. I hope to do a blog on some of Gravett’s other book’s. I love most of her books, Blue Chameleon and The Odd Egg are two of my favorites. Please comment and tell me what picture books you have been reading, I’d love to hear from you.